Echoing others, always appreciate your comments Mike, lots of very useful advice. BPP 4.4: 6000m at 2.14.9 - did this one unstrapped, for the first time. Felt it on my abs the next day, which shows I was working hard I guess! BPP 4.5: 2x2500m, 2min rest, both at exactly 2.08.8. BPP 5.2: 4x800m, 2min rest - 1.55.9, 1.55.9, 1.55.9, 1.55.7. 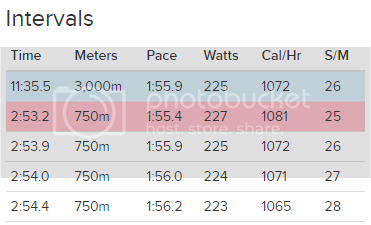 I was meant to try for the average of my 3x1000m from last week, and ended up 0.1 away, which I was happy with considering this was my 6th straight day on the erg. Am currently away from my gym for four days (hence the cramped schedule before) so will finish week 5 when I'm back. Finished week 1 and started week 2 of the BPP. Tonight I will be up for "4 x 750m / 2min rest" at the same pace as the "6 x 500m / 2min rest" I did last week. This will be quite a challenge because I pushed it quite hard last week. @ Ray - I'm excited to see what you can do on the full Pete Plan. Nice first workout! 37 S/R on that last rep! Wow! That's some cardio. Nice work. The difference from 2' to 3.5' is noticeable. @ Bob - thanks for the links. Yeah, I have the same brand of headphones as your Bluetooth amplifier/antenna. Solid brand, reasonable price. I pay like $20 for all my wireless headphones. I hate wires now when I'm rowing. I have to get one of these sound setups. @ Roel - I don't critique Roel, but is that your S/R? 16/17 seems slow for someone your height. Typically, most your height are around 22 plus (or up to 24 or so feels more comfortable). Are you working on power at the expense of S/R? The only reason I ask is you can get into some bad habits early on that are hard to break by artificially slowing down the SR too much. Pausing at the catch or at the end of the finish can lead to problems later. Your hands should always be moving. Took me too long to understand that. You'll do fine on the 4 X 750. I have that same challenge now. Some parts of the 5K PP are a lot like the BPP (see today's notes). Just do the best you can on that upcoming row and don't sweat it. @ Rob - way to get it done with limited/crunched schedule. Be proud of that. Nice 4 X 800! Very solid times. Enjoy the rest! Felt really good about beating the goal target today. Today I ate a little something before the row -- a banana and a few almonds an hour or so before. I workout at 12 noon and I've been working out totally fasted. Perhaps just this little bit of carbs/nuts helped me through it. Maybe I'm just adjusting to the pain tolerance. That's kind of what this 5K training is about. Feeling comfortable pushing your hardest for intermediate and longish rows. I am feeling more comfortable now. I was watching TV while rowing this today. Not paying much attention to it, but more distracted by it trying to keep my mind off of how my body was feeling. Looking forward to the easy SS tomorrow. Nice work! Looks like you held on during the final interval. I hate the 1500 intervals.. I can't imagine 1800s aren't much better. On the food note, I ate a small apple, a carrot, and a sushi roll an hour before my workout. I was worried it would impact me negatively, but I was hungry and decided to risk it. It didn't seem to have any negative impacts. Nice! Is this your first cycle on the PP? You must have been a blur on the last rep at 37 SPM! Again, that session sounds brutal.. Good work on the target! You've got me tempted to give the 5k plan a go at some point in the future as it could be fun to change up the sessions a bit. I'm with you all the way on looking forward to the easy SS tomorrow. I'm still getting the hang of RowPro so messed up the first interval again, although this time I didn't just do it twice and counted it as my first rep and timed the rest manually. I also tested out my new HR monitor, it was quite interesting to see and didn't realise my heart rate was getting that high, the last rep was definitely tough though. After the month off, I was aiming to take it "easy" and just try to hit the same pace as last time, however when I started I got a bit carried away and thought I'd push it..
@Mike, @Ray and @Andy, excellent job, gents! Side note: I recently joined Team Oarsome aka Stu's crew. Jesus, that group puts up some numbers. Hahaha, there are some serious power munchers in our team. My jaw is regularly hitting the floor. Yes, it's my 1st cycle. I recently finished the BPP. Always feel free to comment! Happy with your input I am trying to focus on a powerful stroke which I can maintain for a long period of time so that for shorter and faster pieces I can increase S/R and speed up. I thought that should be the general idea. I am not pausing my stroke and just slide back slowly. The pace of 2:15 feels good for these longer distances at the moment as I feel like I did quite a good exercise but don't come off completely wrecked. Would you suggest for these distances to apply a bit less power each stroke, maintain the same pace but with a higher stroke rate? I understood a powerful stroke would be a better focus then stroke rate but maybe I am overdoing it now. Well done Mike! Looks like a though and painful workout. Good pace! Below my results from yesterday. 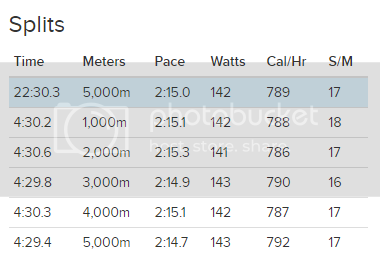 The last two intervals were really getting me and I found it a lot harder than the 6 x 500m. 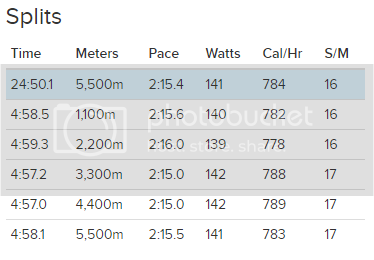 @ Roel - your strength/power per stroke looks to be pretty consistent (don't ask me how I figured that out but I think I took the Watts calculator and divided total Watts based on pace divided by SR and then multiplied on your faster row and it was consistent, so that's good). I'd just be cautious. This theme could start an entirely new thread/debate. Low rate work (low SR work) has it's place but you just don't want to get in bad habits. If your hands are always moving and you feel OK, feel free to do whatever you like. In at least the full PP, Marston suggests 22 to 24 SR for SS work. I went a while two years ago working a great deal with a higher DF and lower SR (18/19). Come race season, I had a very hard time rating up (higher SR). I found that I had developed habits of pausing at the top and bottom of the rower. Exaggerated lean back, too far forward with knees over the ankles, lowering the chain on the way back, sloppy posture (you should sit upright on the rower with good posture), etc. Some tell tale signs if you're doing things wrong: Can you row unstrapped without falling off the back? If not, you're spending too much time leaning back and wasting momentum. Do the fronts of your shins ache? Might be a sign you're leaning too far forward and overreaching with your knees past vertical to your feet (over 90 degrees). Are you spending any time up on your balls of your feet, too much time up on the balls of your feet? You shouldn't spend hardly any time up on the balls of your feet. That's the "sign" to start the next stroke immediately once you reach the balls of your feet. Are your straps coming loose? If so, you're likely leaning too far back and pulling them loose with your feet. They shouldn't come loose while you do SS work (or sprints for that matter). Is your rear chaffed? Same thing, too much leaning back and sloppy posture. Sorry to ramble on, but if none of those are issues, then it's what's comfortable for you. You must have the patience of a saint! I couldn't do rows at that rate. Nice on the 750s, that was solid!! @ Andy - nice work! RowPro, HRM, you're hooked! Look out lightweights in the UK! There's a new kid on the block!! Almost forget my row! 10K today, W3/D4 of the 5K PP - 2:10.7 pace. Pretty consistent all the way/22 SPM. Nothing exciting. Last edited by mdpfirrman on August 16th, 2018, 4:04 pm, edited 1 time in total. @Mike and @Bob the best thing about the indoor rowing teams is that we don't look for the absolute best rowers, we want people who have the right attitude and give 100% most of the time. It's an open invitation from me from any regular posters on here for membership of Team Oarsome. It's great motivation to have monthly.challenge! Well said, Stu. I can already tell that Team Oarsome is about helping people achieve their goals. We're all on the C2 Forum seeking to improve through camaraderie so joining a team makes perfect sense.